Low-carb, no sugar (sometimes gluten-free) treats to maintain weight-loss success. Go ahead! You can have some. 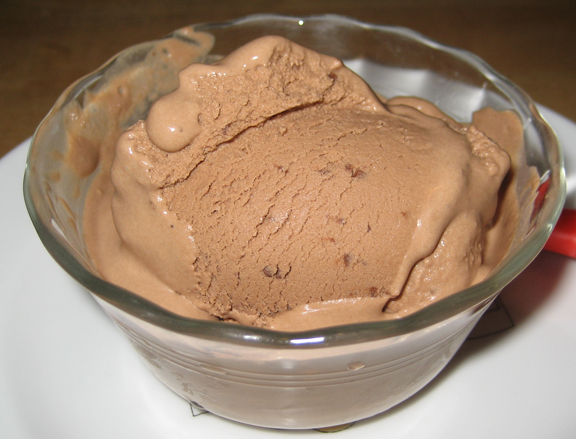 Here is a recipe for Chocolate Ice Cream which I absolute love because sometimes you just want to dig in a bowl of ice cream. I LOVE making this ice cream because it’s so easy. I always have a tub in my freezer because you never know when you might have a chocolate craving. This recipe is gluten-free, sugar-free, and depending on the kind of chocolate you mix in it’s dairy-free or vegan. You’ve got to invest in an ice cream maker or put it on your Christmas list. That’s how I got mine. (Thanks, Christine!) You can make all sorts of sugar-free ice cream at home in so many flavors! Also, if you don’t have one you will need to stir this all by hand every 2 hours or so in the freezer for about 8-12 hours to get similar results. So don’t make this in the middle of the night. Heat the coconut milk and agave in a medium saucepan until it boils. Reduce it to a simmer for a couple of minutes then remove the pan from the heat. Stir in the chocolate until it is completely melted. Cool the mixture at room temperature for 1 hour. Mix in the salt and vanilla. Put the chocolate liquid goodness in your ice cream maker (follow the directions of your machine). You can easily store the ice cream in the freezer for later consumption – like after I get into an argument with my hubby and I want to drown my sorrows in chocolate. 🙂 Or when I’ve baked a batch of Peanut Butter Stevia Cookies. I love crumbling one or two cookies over it. It’s such a delicious treat! This entry was posted in Agave Nectar, Chocolate, Chocolate, Dairy-Free, Dessert, Gluten-Free, Ice Cream, Low Carb, No Sugar, Recipe, Sugar-Free, Vegan and tagged agave nectar, baking chocolate, chocolate, chocolate ice cream, chocolate ice cream recipe, coconut milk, dairy-free, dessert, gluten-free, guilt-free goodies, guilt-free ice cream, guilt-free treats, ice cream maker, no sugar, sugar-free, vegan by mamaseacat. Bookmark the permalink. You had me at guilt free!!! Are you going to try it? I LOVE making this. I always have a tub in my freezer because you never know when you might have a chocolate craving. Gabriella, try 1/2 tsp of stevia and then add more as needed. If you don’t have an ice cream maker, you will need to freeze the ice cream mix for and churn it yourself (mix it up with a spoon) every 45 min for about 4 hours or until it reaches the right consistency.